The growth of Boxing from the mid 18 century along with Wrestling and Street kicking was a direct result of social and economic changes brought on by the Industrial Age. 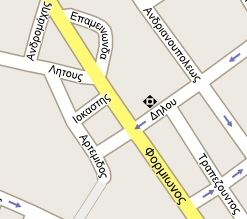 However the methodologies can be traced back to the earliest Greek Olympics. In France kicking became the antithesis to English boxing. The breeding grounds were about the Western Mediterranean where the warmer climate and looser clothing allowed greater freedom of movement. In Paris and some of the French provinces there was some street kicking and others that were influenced by local dance customs and games. It appears that the first rational approach to street kicking started around the beginning of the French Revolution. It was the French Navy who developed Chausson (pronounced Shoh-sohn) as a gymnastic game of fencing with the feet. The term actually means 'slipper' and referred to the sailor's espadrilles. It became a local street game about Marseille, Aubagne and Toulon. In Paris the street kicking became known as La Savate (pronounced Savaht) after the time tested 'old shoe' that so often delivered the final crippling blow. It was not until the Napoleonic Wars did French prisoners of war detained on convict hulks and their British captors came in direct contact with Chausson and Boxing. After the war boxing began to appear with the Chausson, but with anti-British sentiment it took nearly two decades before boxing gained acceptance in France. Meanwhile Chausson enjoyed a growth period. As a game it had different rules but generally the kicks and paume (palm) hits were to touch the targets without causing injury. 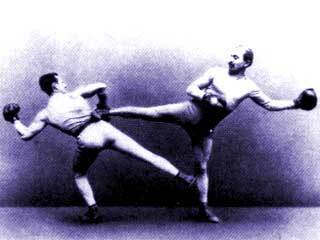 Paume was a prominent element of the early Chausson and Savate systems. In self-defense, Chausson was usually used with a knife or an improvisation tool. In Paris the street kicking of La Savate was used in the poorer quarters and the underworld. It was this fighting method used by the ex convicts employed by Eugene Francois Vidocq (1775-1857) the chief of the "Surete Nationale". They were the first undercover detectives to work in the Parisian underworld in obtaining information and evidence against felons and special criminals. From about the 1820s the activities started to attract the imagination of the young aristocrats. Dressed in their formal clothes they found entertainment about the cities music and dance halls. 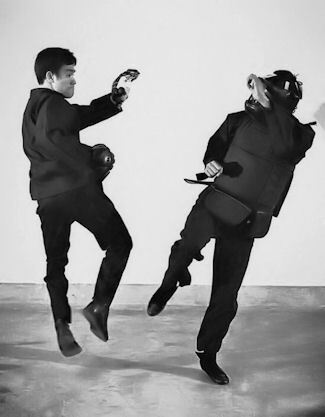 It became the fashion to deal with disagreements of honor with some simple street kicking. This was considered more dignified and expedient than wrestling. Used with the walking Cane, it was very effective in dealing with muggers and troublemakers. The most famous instructor of this period was Michel Cassaux (1794-1869) commonly known as Michel Pissaux. 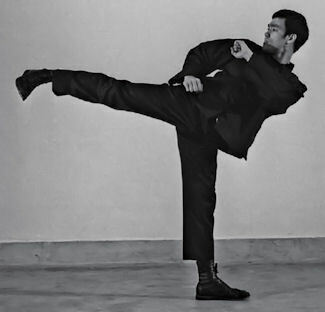 Born in the Belleville district of Paris, he systemized the street kicking methods and named it the 'Art of Savate' and taught it alongside Cane Fencing and Paume. He attracted many personalities including the Duke of Orleans, Count Labattut, Lord Henry Seymore and artist Paul Gavarni. His most outstanding student was Charles Lecour (1808-1894). Born in Oissery he opened a salle in 1832 in Montmartre. He was a competitive athlete and an expert at the Canne and Grand Baton. In 1838 he combined English boxing with French streetkicking and is acknowledged for founding 'La Boxe Francaise'. At first conservative Savateurs did not accept the introduction of boxing. Nevertheless the majority accepted La Boxe Francaise. Charles and his younger brother Hubert Lecour (1820-1871) were very successful. 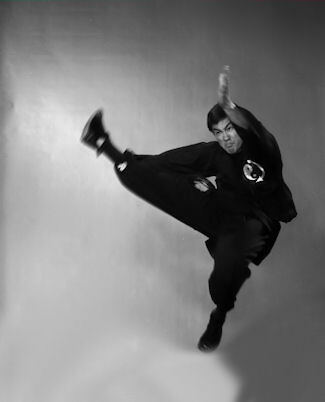 Hubert was instrumental in refining the kicks, punches and integrating grappling. Their demonstrations were often displayed to music, a concept that was later developed into a minor non contact gymnastic kicking discipline of 'Adresse Francaise'. Their classes included nobility, aristocrats and personalities such as Eugene Sue, Alphose Karr, Theophile Gautier and the author of The Three Musketeers, Alexander Dumas. There were many noted instructors and one Louis Laboucher (1807-1866) developed many successful savateurs. One of his students was Giocchino Rossini, the famous Italian Opera composer. In Italy, a small following of the Laboucher method appears to have climaxed around 1870. One of the most charismatic and competent fighters during the 1850s was Louis Vigneron (1827-1871). Born in Paris he opened a small salle in 1848. He built a reputation by teaching the military and beating challengers of any combat discipline. He acquired the nickname 'Cannonman' by demonstrating the firing a cannonball from a heavy cannon held on his shoulders to his partner. On the 22 August 1871 with a miscalculation of powder the fatigued cannon exploded and he and his partner were killed. In 1853 the military collage 'L'Ecole De Joinville' was established and part of the training included La Boxe Francaise and stick fencing. This commenced a long association with the military although it is believed that Chausson was practiced by the French Foreign Legion some twenty years earlier. The disciplines became cultural arts, and through adventurers, emigration and movements of the military they found their way across Europe, Africa, England, Canada and America. During the second half of the 19th century physical education and gymnastics became compulsory with the military from 1853 and boy schools from 1872. It saw the emergence of international wrestling, the development of French wrestling (Parisian lutte), and Savate as a sport and personal combat. One of the most important Savateurs to emerge in this period was Joseph Pierre Charlemont (1830-1914). Born in L'Esdain he received his training from Louis Vigneron. He soon gained a formidable reputation by defeating numerous exponents of various combat disciplines. He consolidated a defensive and educational system, revising the military syllabus and instructing recruits from 1865-1870. In 1893 his son Charles succeeded him and Joseph wrote his famous book 'La Boxe Francaise' which was published in 1899. Charles Charlemont (1862-1944) was an advocate of physical culture at an early age. His most famous encounter and acclaimed by the French was in 1899 when he defeated boxer Jerry Driscoll. Unfortunately the contest was held in unsatisfactory conditions and ended in a degree of controversy. Charles became a driving force in establishing the sport of La Boxe Francaise. One of Josephs outstanding students was Victor Casteres (1866-1930) who opened his own salle in 1893. In London 1898 he defeated a boxer in a contest that was personally judged by the Marquis of Queensbury. He wrote a book on Savate and from his English promotions the first book in English, 'The French Method' was written and published by Georges D'Armoric in 1898. Pierre Vigny (1869-?) founded the first school in Geneva, Switzerland in 1894 with his brother Paul. He moved to London in 1900 where he operated a successful school for about seven years. He became noted for his Anglo-French Canne approach. A method that was adopted by William Barton-Wright (1860-1951) into his "Bartitsu" and adapted by Henry Lang (1895-?) who taught it to the Indian Police, Scouts and instructors. In the 80 years since its ruthless street fighting origins, Savate has integrated a wide range of disciplines and has evolved into a professional combat science. It could be practiced as a sport, self defense and for recreation and was practiced in the trenches during the Great War. From the beginning of the 20-century it created a lot of interest throughout Western Europe. For the general public it became necessary to construct a simple self-defense to cater for the non-athletic civilian. During the first quarter many books and self-defense courses appeared for non-combatants. La Boxe Francaise became a demonstration sport at the 1924 Paris Olympics. Its success prompted a promotional tour to London and in 1927 demonstrations were held at the famous Southwark boxing stadium, "The Ring". The team created a lot of interest, but English boxers protecting their own sport labeled the kicking fit for "women and sissies". This circulated about English sportsmen and destroyed its acceptance as a gentleman's sport. Further complicating its image was its vicious reputation with the French apaches (hooligans), gangsters and the street kicking practices of the South and East Londoners. This adverse attitude towards kicking was nurtured throughout English speaking countries for some three decades before kicking as an athletic discipline started to gain acceptance. Ironically it didn't stop elements being introduced into a number unarmed combat courses. In America from the late 1920s and throughout the Second World War it was included in the syllabus taught to the Marines, the F.B.I. and Department of Justice. In France many of the Resistance were trained in Savate. After the war a large majority of traditional folk arts disappeared from lack of interest. Others continued as if unaffected by social and economic changes. In southern France, Chausson persisted but was influenced by wartime unarmed combat methods. This new synthesis became an underground sub-culture. It was never organized or promoted and has only persisted through the practice of a minority. A product of this period was Alain Jebrayel (1898-1954) who commenced Chausson at an early age under his father. He became a third generation exponent as passed down from his grandfather. Athletically, he was a strong person with excellent muscular control and a 'killer instinct'. After the war he opened a small salle in Nice named 'Chausson de la Riviera'. He integrated some commando-unarmed combat that he used as a resistance fighter. Two of his foremost students Philippe Dufour and Marcel Villenaux continued teaching after he died in an accident in 1954. In Paris, after the war, it was found that many prominent instructors had died and others had simply lost interest. The Parisian's believed that for the disciplines to be more widely accepted it was necessary for it be developed as a sport. Count Pierre Baruzy (1897-1994) was instrumental in reorganizing La Boxe Francaise-Savate (B.F.Savate) and promoting the sport. He commenced practicing under Charles Charlemont in 1910 and became one of the most enthusiastic and productive savateurs of the 20-century. Between 1922-1935 he won 11 championships and held three titles in three weight divisions simultaneously and won two championships at the 1924 Paris Olympic Games. It was Pierre's enthusiasm and perseverance that the 'Federation Francaise de Boxe Francaise-Savate et Disciplines Assimilees' was founded with ministerial support. He was honored as President and Founder. In 1985 he was made Honorary President of the 'Federation International de Boxe Francaise-Savate' that was created for the international promotion of the sport. Roger Lafond (1913- ) was another important Parisian instructor after the Second World War. He is a third generation exponent whose grandfathers linkage can be traced back to the Lecours. Where Baruzy was a traditionalist, Lafond introduced some post war ideas into his syllabus. 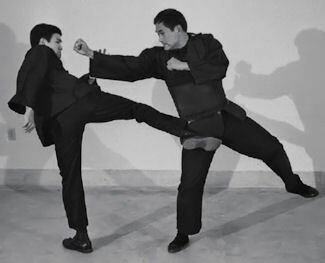 In 1955 he created "La Panache" that included some Japanese hand to hand combat. At one stage he operated the majority of the schools in Paris. Lafond Savate is now the only syllabus in Paris to teach elements of traditional Savate. During the mid 1970's the Chinese-American martial artist Bruce Lee (1940-1973) created a Kung Fu craze through his movies. This resulted in a global following of Asian martial arts by the 1980's. These arts varied from combat arts, to arts of human movement. This variety has offered something in the martial art spectrum to suit nearly every personality and need. Due to the variety of applications, there has been an assessment and interaction of information seeking improved efficiency, safety and knowledge. This will continue in the future as old and new ideas, Eastern and Western methods are constantly being challenged and reassessed to achieve a perceived reality. "Savate Sport" is now an international kickboxing sport, and with its growth there is an increase in interest in the traditional and self-defense aspects of the art. 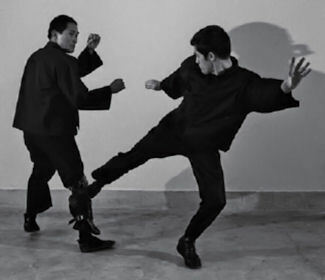 This has placed pressure on the Federation, who with their concentration on the sport, realize that there are only a few veteran instructors around the world able to teach Savate and its associated weaponry, as a collective discipline.